How does one go about taking the techniques used all summer for training a dog and apply them to the hunting fields? In training, we stress control. We use a lead to take the dog from the vehicle to the start of the field, require the dog to hup in front and facing us, set him up for the first cast and virtually control his every cast. This is done to assure the dog’s quick response to our commands and to center his activity close to us. We control where the birds are rolled in or planted, which way we want to proceed down the field and just how fast we want to cover the field. In the hunting field, not much needs to change, initially, except that things do happen differently. The biggest difference is our excitement for the hunt. We, as hunters, portray the excitement of wild birds, crisp fall air, new territory - and that excitement carries over into our dog. We get excited, step out of the truck, drop the tailgate, open the door of the crate and out goes the dog. He is 50-yards down the field and we are still scrambling to get guns out, shells ready then coordinate the hunters. And all this time your dog has flushed birds all over the field you are about to hunt. It doesn’t have to be that way. When hunting, do the same things you did in training all summer long. Drive to the field, get out and look the lay of the land. Then coordinate the hunt with the hunting party, get yourself ready with gun, whistle, shells, gloves, water, etc... Then put the leash on the dog, let him out of the crate and walk at heel to the starting point of the field. Set the dog up, in front and facing you. After checking your hunting partners, cast the dog off just like training. "Remember, consistency in training can carry over to the hunting fields." Control the dog initially, set the distance and allow the dog to hunt the field in front of you. If a dog never learns to charge into a field and only learns that the training procedure is the same thing he does in the hunting field, things go much easier. 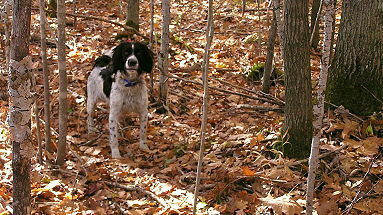 Granted, while hunting, the dog will adapt his pattern of quartering to the lay of the land. He will check out likely bird holding spots and break the normal training pattern, but there will be the connection with you and the dog. Remember, consistency in training can carry over to the hunting fields. As the fall hunting season comes into full swing, it is the time when you find out if the dog’s training paid off and maybe, more importantly, what to work on after the season so your dog will be even better next year. I have a tendency to accept less than perfect dog work when hunting the wild birds than when I am in a training session. The training session gives you the opportunity to work on situations such as delivery to hand with a dead bird, taking an exact line to a mark or strict command to every command given. In the midst of the hunting situation, you may think the dog didn’t take the perfect line but let him work it out. He circles the fall area - so it takes a little extra time to find the fall. Don’t hack the dog into a perfect line. Remember, wild roosters are much different in how they behave than the training birds you - or your trainer - may have been using. "But learn to accept the dog where he is in the training and you can have a much more enjoyable hunt." If the dog takes a running bird in heavy cattails, don’t be whistling him the stay close. Go with the dog. If you can stop him on a runner because of your training, then stop him. But if he is young and hot on scent, go with the dog. Shoot the bird and enjoy the hunt rather than demand the dog stay close all of the time. Uncontrolled dogs are no fun at all and training is a must. But learn to accept the dog where he is in the training and you can have a much more enjoyable hunt. Sometimes a dog that stays close trails out a bird, then retrieves only part way to hand. That is good enough for some folks. The same dog under a different person would prove frustrating because they may say the dog doesn’t get out to find birds, won’t retrieve and is too slow. 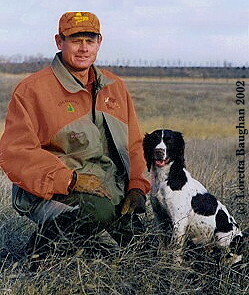 If your hunting style doesn’t match the dogs you have, you have several options. Change your hunting style to adjust to the dog (which probably will not happen), train your dog to adapt to your style (which can happen if the personality of the dog is close to your personality) or get a different dog and have it trained so it is a perfect match. My boys and I hunt with several dogs in the field at one time and the personality and style of hunting of each dog is different. We must accept the dogs where they are, hunt hard and find birds. Any problems encountered - we correct in the off season. Hunt them when you can and fix the problems later.